England captain Joe Root predicts there is a lot more to come from James Anderson after he became the most successful fast bowler ever in Test cricket. The 36-year-old Lancastrian had begun the day level on 563 with Australian Glenn McGrath, having taken two wickets the previous evening at the end of a day in which best friend Alastair Cook made an emotional farewell century. Anderson is now fourth on the all-time list behind a trio of spinners - Muttiah Muralitharan (800), Shane Warne (708) and Anil Kumble (619). Anderson was given a standing ovation as he left the field alongside Cook, England's most-capped player, record run scorer and century-maker. They have been England mainstays for 12 years, playing key roles in four Ashes series wins. Former skipper Cook, who announced his retirement from international cricket after the fourth Test, said: "To see Jimmy pass Glenn McGrath's record was brilliant. We've lived in each other's pockets for 12 years, and it's been a privilege to play with England's greatest cricketer. "What he must go through, physically and mentally, to do what he does - he's a freak. It's been a pleasure standing at first slip for his bowling." 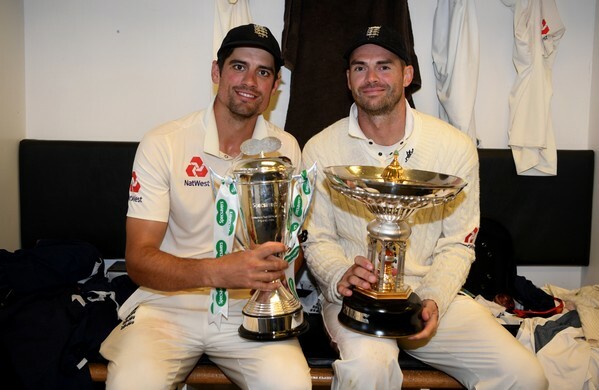 Anderson was close to tears after finishing the series as the leading wicket-taker with 24 in five Tests, saying: "I've just enjoyed playing for England." And he wants to keep going.